Every Picture Tells a Story has been an ongoing series on this blog since 2011. 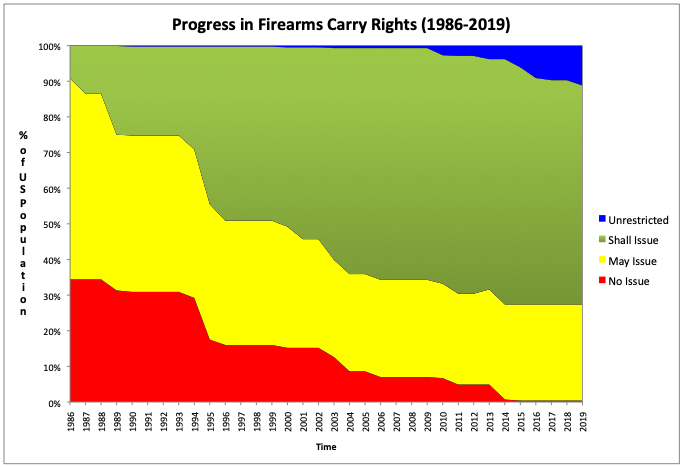 It graphically illustrates the growth in firearm carry rights over time. Going back to 1986, over 90% of Americans lived in states with either no carry permitted or may-issue carry permits. By contrast, approximately two-thirds of all Americans live in a state with either shall-issue permits or constitutional carry. The area that has shown the most growth in terms of number of states is constitutional or permitless concealed carry. With the recent addition of South Dakota and Oklahoma, there are now 15 states that do not require you to have a permit to carry concealed. This equates to about 11% of the population of the United States. As the creator of this graphic, Rob Vance, notes, "While the Supes are figuring out if the word "bear" in the 2nd Amendment actually means something - 15 states have already clarified that simple reading of the English word meaning 'to carry.'" This number would have jumped even more if the Republican leaders of the North Carolina Senate had not refused to bring up the bill allowing permitless carry in the state. The bill had passed the NC House but Senate Republican were afraid of losing their super-majority if they went on record voting for permitless carry. Ironically, they lost their super-majority anyway. Almost word for word the case in Florida. Did you have Republicans selling out to Michael Bloomberg? Others selling out to the Demanding Mommies? Did you have Senators boffing each other in quick trysts? This year, there is no good news to be found. Based on NC and FL, you could guess Oklahoma will be the last. "Ironically, they lost their super-majority anyway." Or perhaps not so ironically. In Tennessee, feckless Republicans are not even filing a CC bill this year.